Perfect day for riding hydrogen buses from the central station to the Fiera Bolzano fairgrounds at Bolzano South, and nearby the Hydrogen Refuelling Station. 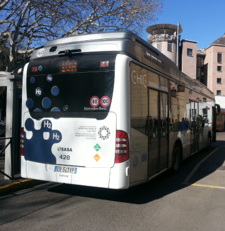 In Bolzano, the public transport company SASA SpA-AG runs fuel cell-buses on the “10A” and “10 B” lines resp. They refuel hydrogen at the same station as the fuel cell-electric vehicles. 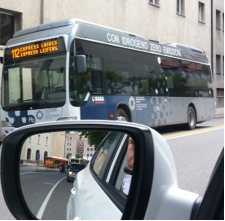 On March 18, 2016, I got on at Bolzano central station and rode in a fuel cell-bus going to Bolzano South. In this picture below, I am photographing out of the window of the Hyundai ix35 FCEV (fuel cell-electric vehicle) as I am on the last leg of the Hydrogen Challenge #2 from Bergen to Bolzano. In this picture, hydrogen refuelling at 350 bar is about to take place at the Hydrogen Refuelling Station in Bolzano South. 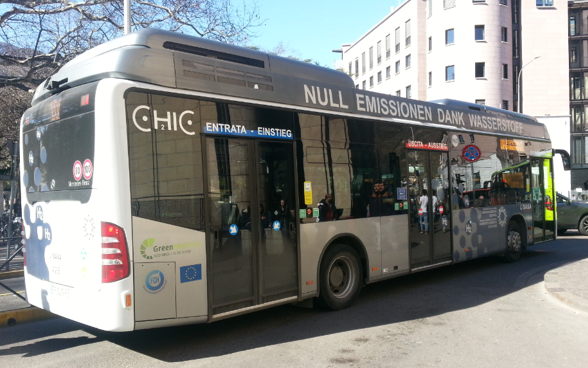 The bus model is a Mercedes Benz 0 530 Citaro new Fuelcell.